GBO Translation Panel, from left to right: Ed Nawotka, Edwin Frank, Susan Bernofsky, Declan Spring and Stephen Twilley. Three top US book editors and one translator share their top tips for working with literary translations. 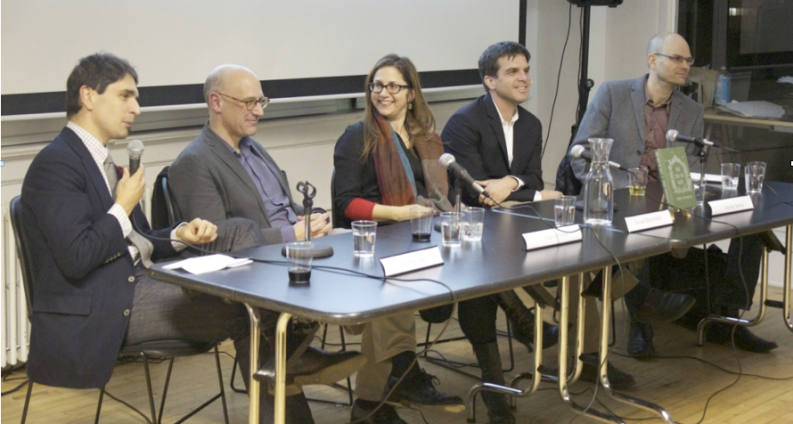 On Tuesday night, the German Book Office in New York City hosted a panel entitled, “Editing Translations – Editing Susan,” which offered attendees advice on editing works in translation. It followed a day-long workshop in which German-English translator Susan Bernofsky worked with up-and-coming translators around a text by Jenny Erpenbeck, whose novel The End of Days (New Directions) Bernofsky had recently translated. Moderated by Publishing Perspectives editor-in-chief Ed Nawotka, panelists included, in addition to Ms. Bernofsky: Declan Spring, vice president and senior editor at New Directions; Edwin Frank, editor of New York Review Books Classics; and Stephen Twilley, managing editor of Public Culture and Public Books — all three of whom have edited her work. According to Bernofsky, the problem with translation is this: you must create something that has legibility in its own right, not necessarily “an exact representation of,” the text, but a credible version of the author’s text, voice, and — of perhaps most importance — tone. She gave a shout-out to Erpenbeck, sitting in the audience, and the two recalled the collaborative work between translator and author. When it is clear the translation cannot be an exact representation of the original, the input of the author is essential. Stephen Twilley says that an editor must always ask him or herself, “Can the text justify this?” This means, besides listening to the author, one must “listen” to the text. What is the significance of a particular detail in the narrative, for example? What are the consequences of removing or altering it? If this is removed or altered, does the work lose something crucial? Edwin Frank made the point – and all agreed – that translation occurs not at the level of syntax and semantics, but at that of style. “You can translate syntax and semantics and you don’t have a book;” what is important for a work of translation is not that it matches the original word-for-word, but that the author’s original narrative, with all its idiosyncrasies and subtleties, is kept intact. Have a tip to contribute? Let us know in the comments!